The new KLE Harmony series of RCA connectors gives audiophiles yet another choice in low-mass RCA connectors. This new design by Keith Louis Eichmann (KLE) comes in three flavors. The first version called the Copper Harmony is a pure copper base version, with silver plating for both the signal and ground/return pins. The second version VH Audio stocks is the PURE Harmony. This version claims to achieve an IACS of 106% for BOTH the signal pin, as well as the ground/return pins. 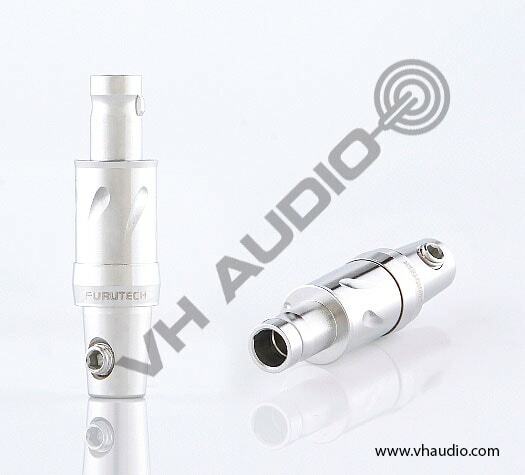 The third version VH Audio stocks is the ABSOLUTE Harmony, which is similar to the Pure Harmony, but has an IACS that is claimed to have an IACS conductivity greater than 106%. A nice addition to these connectors is the inclusion of a soft, pliable rubber grommet with an ID of about .14" that can 'stretch' around smaller O.D. cables. Without the rubber grommet, the I.D. of the cable entry portion of the barrel is about .385". Two grub screws also help secure this connector to your cables, for additional peace-of-mind, when it comes to strain relief, and protecting against breakage. Yet another great choice for fine wire, low mass DIY RCA interconnects like the VenHaus DIY Silver recipe. Each package contains 2 pairs of RCA plugs (4 total plugs). ETI LINK RCA 4 pk - $78.99 ETI LINK RCA 2 pk - $39.99 Silver Bullet RCA 4 pk - $148.50 (reg. $165.00) Silver Bullet RCA 2 pk - $82.50 Bullet Plug Aluminum Housing - $5.99 ea. Bullet Plug Rubber Grommit - $1.59 ea. 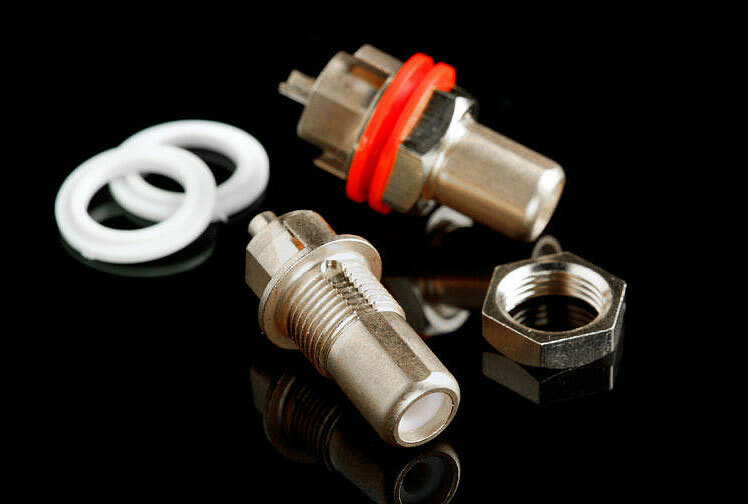 The new ETI Research LINK RCA Connector is based upon the original Bullet Plug RCA from ETI Research, but has been improved with new benefits. The hollow central signal pin is now made from pure copper (vs Tellurium Copper) for even better conductivity. The ground/return conductor pin is still made from tellurium copper, to maintain strength. Each package contains 2 pairs of LINK RCA Plugs (4 total plugs), or you may optionally order a single pair. Please specify what color code you want for the pair, in the 'special instructions' section of the online checkout. 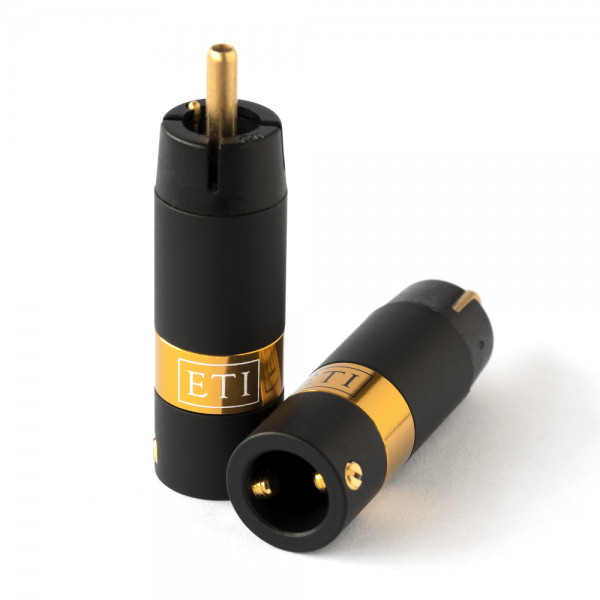 The original ETI Research Bullet Plug connector's new approach to RCA/phono connection where every aspect of electron flow has been considered. 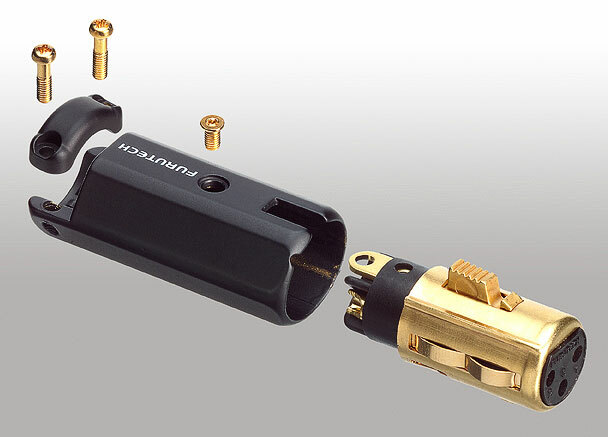 The result is an RCA compatible connector that can improve the performance of any analogue, digital or video cable - often dramatically. 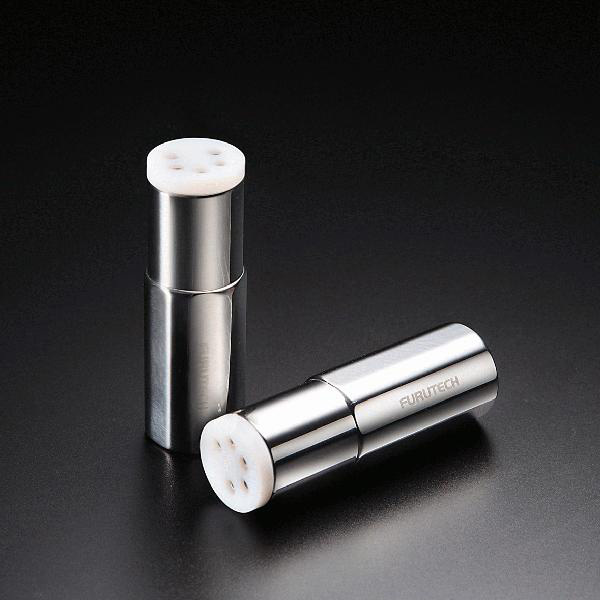 Please note the ETI Bullet Plug is minimalist in design and appearance. Both the LINK, and the Silver ETI Bullet RCA plugs work superbly with DIY IC's, with the Silver Bullet Plug being truly exceptional on the VenHaus DIY Silver interconnect recipe. Each package contains 2 pairs of Bullet Plugs (4 total plugs). 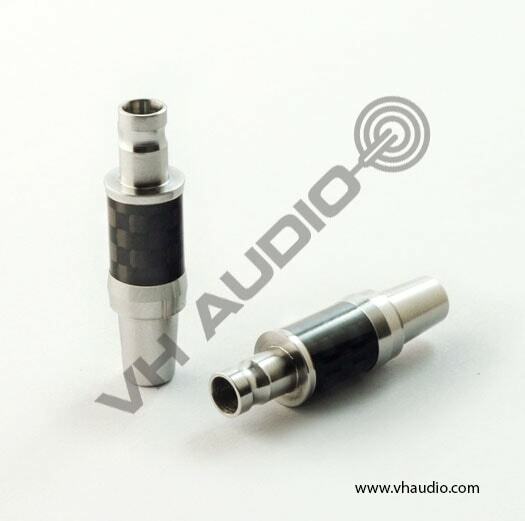 Machined aluminum Bullet plug housings are also available (sold separately) for the ETI Bullet Plug RCA's. WBT-0102 NextGen RCA plug Kit (Gold) - $299.99 WBT-0102 NextGen RCA plug Kit (Silver) - $435.99 WBT-0152 NextGen RCA plug Kit (Gold) - $299.99 WBT-0152 NextGen RCA plug Kit (Silver) - $435.99 WBT-0114 Cu (4 pk kit) - $175.99 ea. WBT-0114 Ag (4 pk kit) - $275.99 ea. 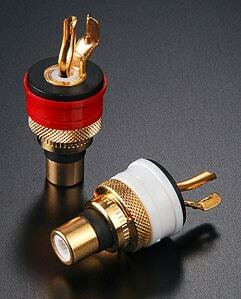 The WBT-0102 and WBT-0152 Nextgen RCA plug utilizes conductor material made of pure copper, and then direct gold plated. The silver version is made of pure silver. Fits cable up to 9.1 mm dia. (WBT-0102 series) or 11.3 mm (WBT-0152 series). Sold in a kit of 4, and includes WBT solder and Torx key. 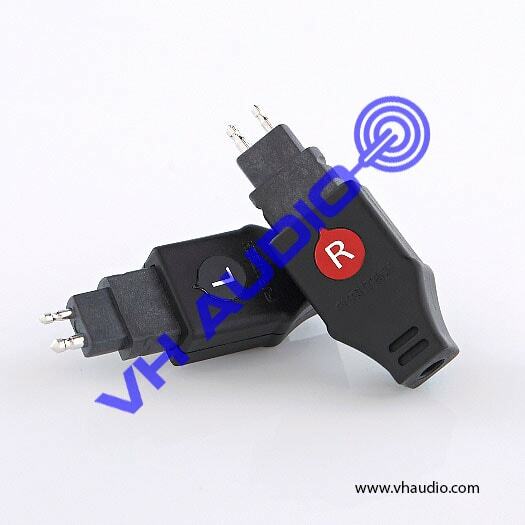 The Nextgen RCA plug has gone through a few revisions since its introduction, and the latest versions offered (WBT-0102 and WBT-0152) use metal bodies. Cost is slightly more than the WBT-0110, but the added rigidity and robustness of the connection is well worth the few extra $$, IMHO. The WBT-0102 will accomodate cable diameters up to 9mm, while the WBT-0152 will accomodate cable diameters from 9.1 to 11.3 mm. The WBT-0152 is slightly longer than the WBT-0102 (55mm vs. 51 mm), and both have black bodies. The WBT-0114 Nextgen RCA Plugs is constructed of Ultramid® and available in nine different colors for multi-channel identification. The barrel is made of brass and finished in a matte black galvanized finish. The contact elements are made of high-purity copper, second only to silver, in order to ensure optimum signal transmission. Conductor metal is nickel free and gold plated to protect the surface from oxidation and to ensure contact quality. 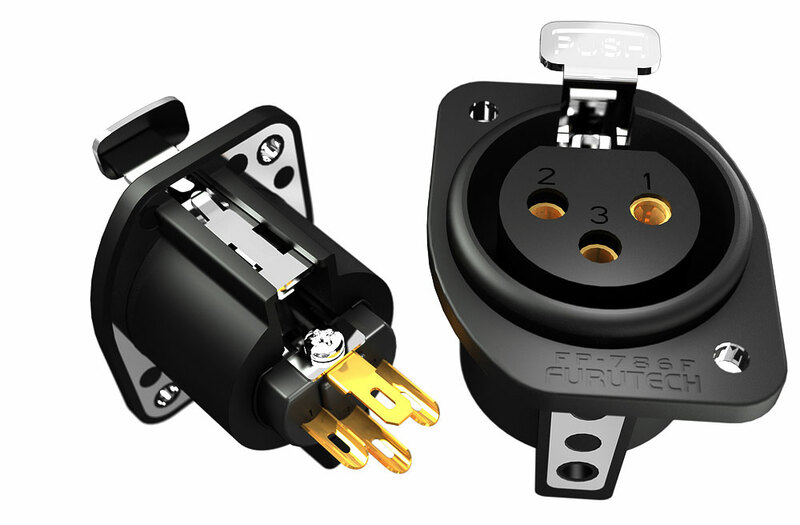 Furutech has just introduced the new FT-903 series of RCA sockets, available in Gold or Rhodium plated versions. This low-mass design uses pure copper conductor material and then plated with either gold or rhodium. The body and locking nut is made from a liquid crystal polymer resin, that has superior dampening properties to coventional. 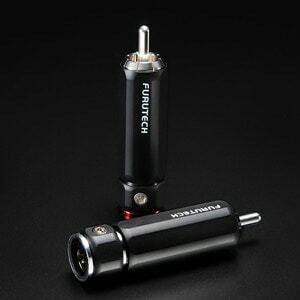 The Furutech FT-903 RCA sockets might offer the best bang-for-the-buck of any low-mass RCA socket on the market. The Furutech FP-901G and FP-901R RCA sockets are top-notch, and deserve to be considered among the best female RCA sockets on the market. Features include: Positive/Hot Center Pin milled from a single piece of pure copper (with phosphor bronze locking ring); The ground/Return conductor is milled from a single piece of pure copper; non-magnetic 24k gold-plated materials; Eutectic brass housing (painted black) and 24k gold-plated nut cap; Mounting Materials are made of nylon (red or white - outer) and PTFE Flouropolymer (white - inner) insulation; Mounting insulation accommodates chassis panels of any thickness; Connection Type is made for soldering. 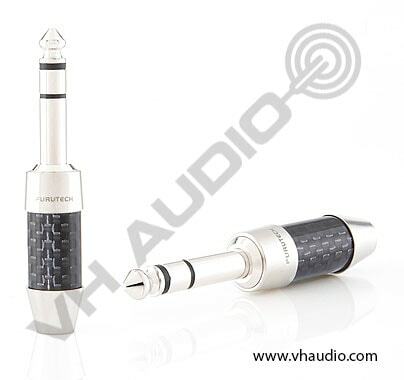 The Furutech FP-901 is Available with either GOLD or RHODIUM plating. The WBT brand has become synonomous with "the best", and perhaps "expensive"- but we all know you get what you pay for... 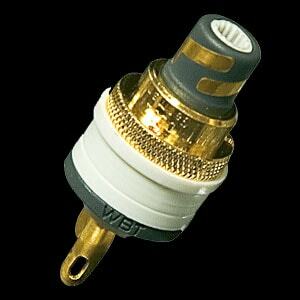 When looking for quality RCA sockets, it doesn't take long to realize that WBT is as good as it gets. People spend a great deal of money on cables and interconnects, but forget the other half of this equation is the socket you connect your cables to. The WBT-0201 Topline RCA Socket utilizes high copper content and 24k WBT supra-gold plating. The signal wire socket utilizes a dual prism spring loaded feature to assure secure contact. It also uses a Flouropolymer dielectric. Includes mounting insulation to accommodate panel thicknesses from 0.1-4.2mm. Tightens from outside of chassis using included mounting nut. Kit includes 1 red and 1 white color-coded socket, and a length of WBT 4% silver solder. 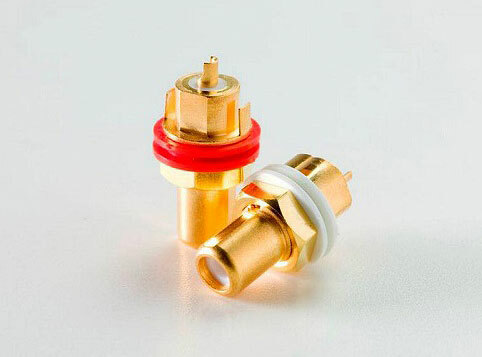 The WBT-0210 Cu NextGen RCA socket uses conductor material made of pure copper, and are direct gold or plated. The signal pin hole is a spring loaded WBT double prism contact, while the ground/return portion utilizes a patented double-wave contact. The socket also uses a Flouropolymer dielectric with torsion proof mounting. Tightens from outside using the included three-hole counter nut. Transmission bandwidth is 1 Ghz, and the socket has a characteristic impedence of 75 ohms, meaning this is an ideal socket for digital components, as well as analog components. 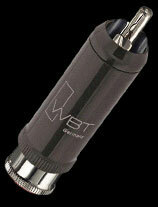 The WBT-0210 Ag NextGen RCA socket utilizes conductor material made of pure, solid silver. The signal pin hole is a spring loaded WBT double prism contact, while the ground/return portion utilizes a patented double-wave contact. The socket also uses a Flouropolymer dielectric with torsion proof mounting. Tightens from outside using the included three-hole counter nut. Transmission bandwidth is 1 Ghz, and the socket has a characteristic impedence of 75 ohms, meaning this is an ideal socket for digital components, as well as analog components. Offered in PAIRS with RED and WHITE color code (1 piece each). FP-601M GOLD XLR Plug (male) - $81.99 ea. FP-602F GOLD XLR Plug (female) - $89.99 ea. 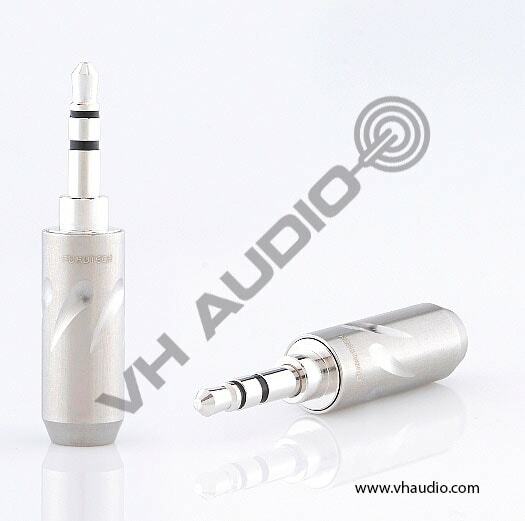 FP-601M Rhodium XLR Plug (male) - $98.99 ea. 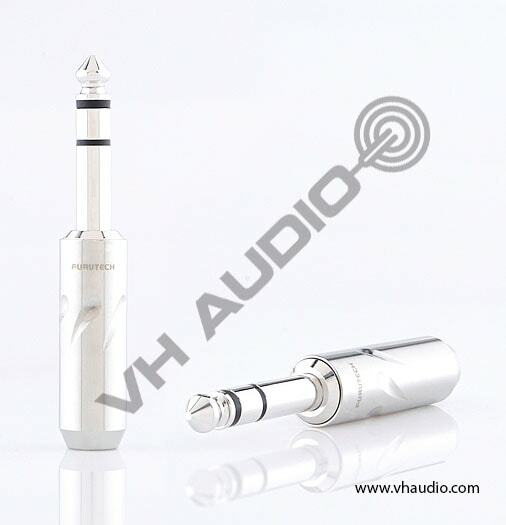 FP-602F Rhodium XLR Plug (female) - $116.99 ea. 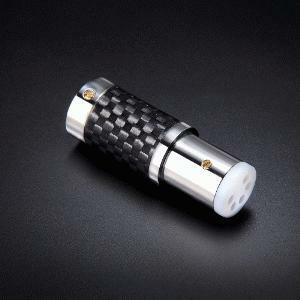 CF-601M Carbon Fiber XLR Plug (male) - $130.99 ea. 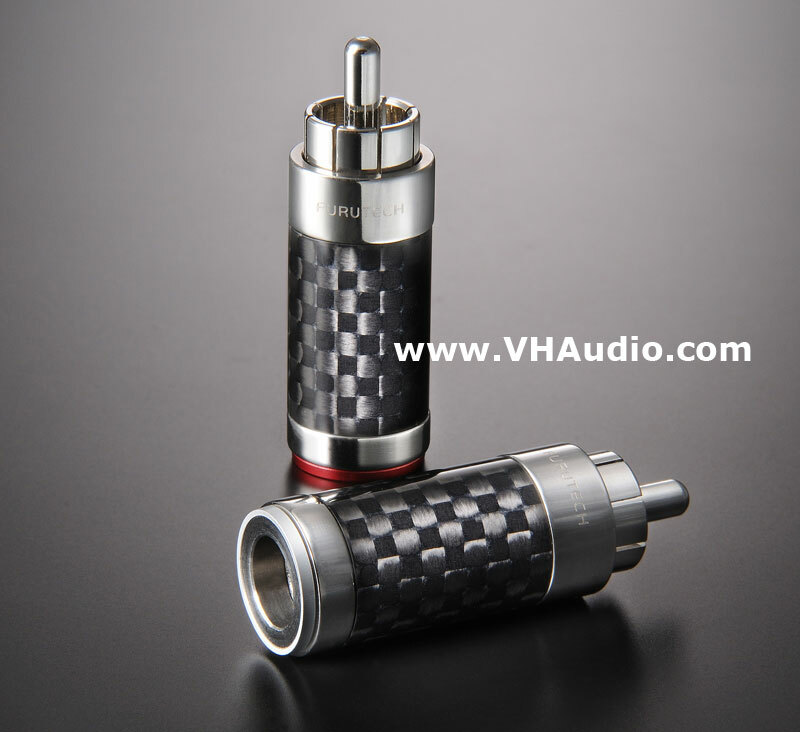 CF-602F Carbon Fiber XLR Plug (female) - $146.99 ea. 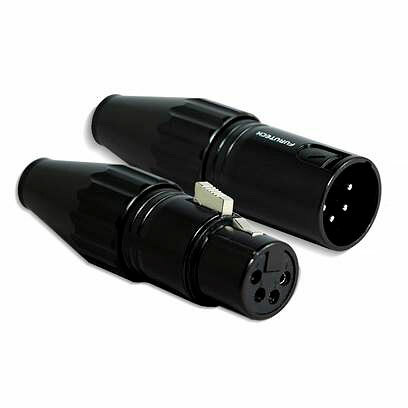 FP-705M XLR Plug (4-pin male) - $30.99 ea. FP-706F XLR Plug (4-pin female) - $32.99 ea. 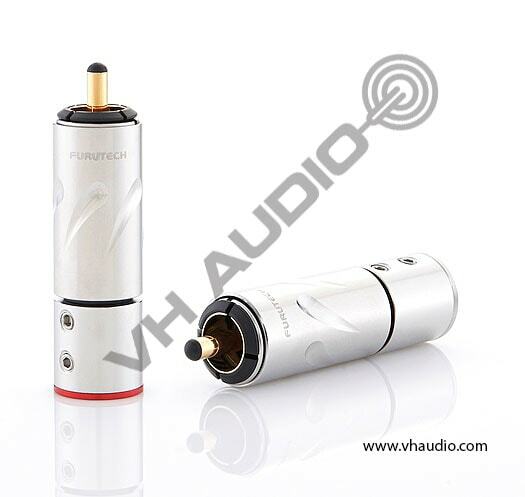 Furutech FP-601M and FP-602F RHODIUM or GOLD-plated XLR plugs are among the best XLR plugs available on the market. This plug has Rhodium plating over phosphor bronze- a material that contains about 50% more copper than typical brass. Flouropolymer insulation is used as the insulator for the Furutech FP-601M and FP-602F, for extremely low dielectric constant, and the shell is non-magnetic solid brass. 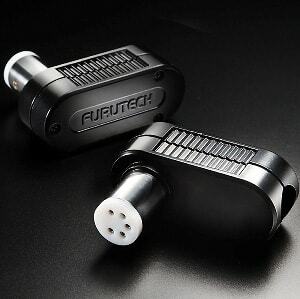 The entire plug has been processed with Furutech's proprietary demagnetization and cryogenic treatment process, meaning exceptional sound quality and better durability over typical XLR connectors. This is a great XLR connector for balanced analog and AES/EBU digital applications that require 110 ohm impedance. 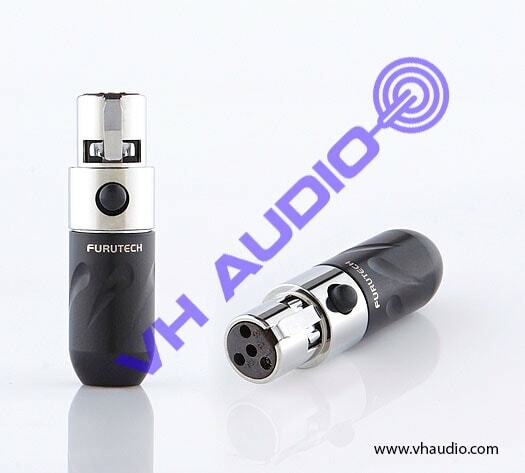 The Furutech FP-601M and FP-602F accomodates cable diameters from 6.4mm to 13.0mm. 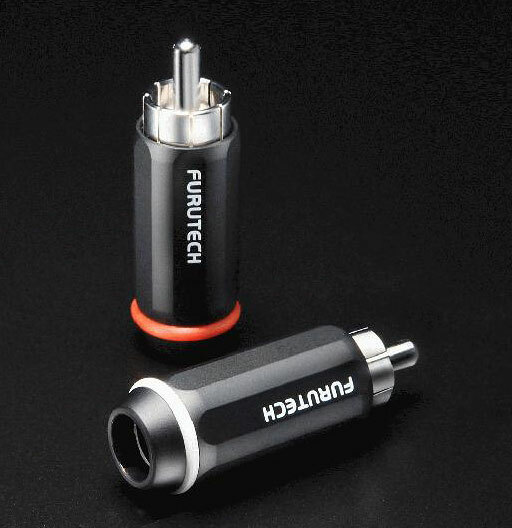 The Furutech CF-601M and CF-602F XLR connectors are Furutech's flagship design, previously only available to high-end OEM's. 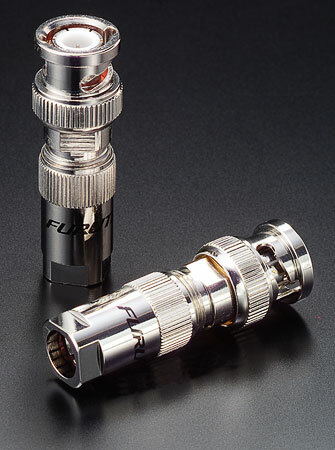 The Furutech CF-601M and CF-602F XLR connectors have rhodium-plated beryllium copper and phosphor bronze conductors, and feature a carbon fiber and non-magnetic stainless steel housing. The insulator is PVDF Flouropolymer, and the termination method is solder only. Specified for cable diameters up to 10.0mm. Dimensions: 18.6mm diameter x 77.4mm overall length. FP-681M GOLD Male chassis socket - $49.99 ea. FP-681M RHODIUM Male chassis socket - $68.95 ea. FP-682F(R) Female (only 1 pc left) - $68.95 ea. FT-785M GOLD Male chassis socket - $39.99 ea. FT-785M RHODIUM Male chassis socket - $44.99 ea. FT-786F GOLD female chassis socket - $41.99 ea. 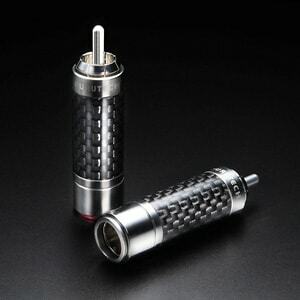 FT-786F RHODIUM female chassis socket - $47.99 ea. Furutech FP-681M and FP-682F chassis mount XLR sockets are considered significant upgrades over what is currently available on the market. These are made with high conductivity Phosphor bronze contacts that are either direct gold or Rhodium plated, and are insulated with Flouropolymer. The housings are a rugged, non-magnetic Zinc/Magnesium Alloy, and the entire asembly has undergone Furutech's proprietary cryogenic treatment and demagnetization process. FP-DIN Straight DIN Connector - $105.99 ea. FP-DIN L-90 Angled DIN Connector - $127.99 ea. CF-DIN Carbon Fiber DIN Connector - $167.99 ea. FINALLY! 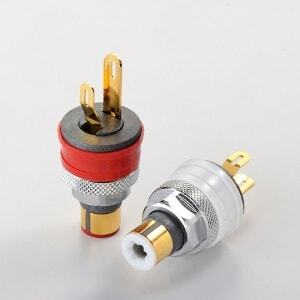 Audiophile grade DIN Phono connectors for you to terminate into your favorite cable or wire!!! 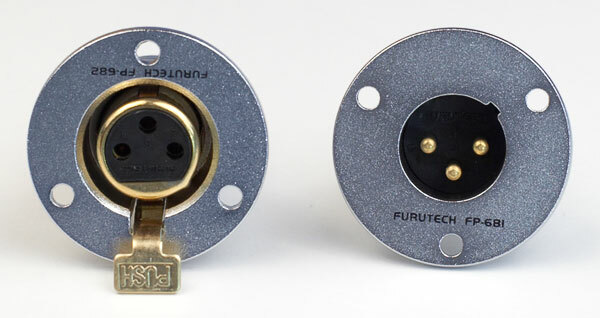 The Furutech FP-DIN and FP-DIN L-90 phono connectors feature: Rhodium-plated (Alpha) phosphor bronze conductors, Flouropolymer insulated body, non-magnetic stainless steel housing, and soldered connections. Specified for cable diameters max. 10.0mm. FP-DIN(L) - 45 (L) X 19(W) X 33.4(H) mm approx. Furutech's FP-704G (Stereo) and FP-703G (Mono) 1/4" gold-plated phone plugs are Furutech's audiophile quality 1/4" phone plugs. Great for mic, guitar cables, and instrument cables, as well as headphone cables. Made with Furutech's (Alpha) Eutectic cast copper alloy center pin, a copper alloy rear housing with PBT and fiberglass insulation. Connections must be soldered. Zinc-Mg Alloy Casting body housing. Will accept cable diameters up to 8mm Dimensions. Housing: 17.8 diameter X 65.8mm. 97.3mm overall length. 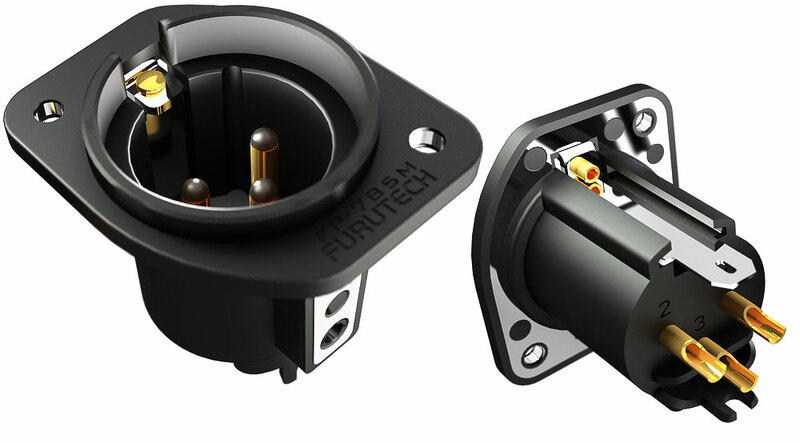 Furutech has introduced a new line of headphone connectors!. 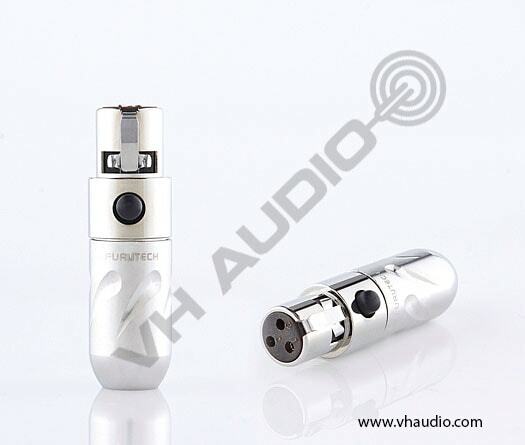 First, are the 1/4" (6.3 mm) stereo connectors: the Furutech FT-763 and CF-763. 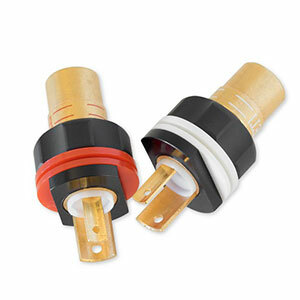 Both of these connectors use non-magnetic rhodium-plated (Alpha) Phosphor bronze conductor, with a fluoropolymer insulation. 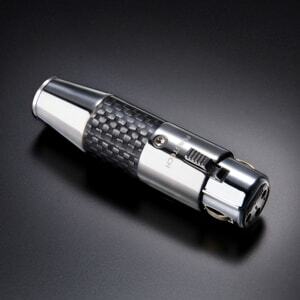 The outer housing of the FT-763 is non-magnetic stainless, whereas the CF-763 also employs a carbon fiber layer. Both connectors accomodate cables up to a maximum O.D. of 8 mm. Must be soldered. 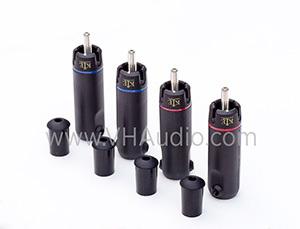 The FT-735 is a 3.5 mm (1/8") stereo connector that also uses non-magnetic rhodium-plated (Alpha) Phosphor bronze conductor, and fluoropolymer insulation. This connector will accomodate core insualtion cable diameter of up to 5.0 mm. Must be soldered. 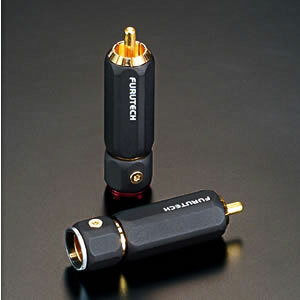 The Furutech FT-608mF mini female 3 pin XLR also uses Furutech's (Alpha) Phosphor bronze, but then uses polyphenylene sulfide insulation for better solderability with this smaller connector. Specified for core cable diamaters up to 5.0 mm. Must be soldered. 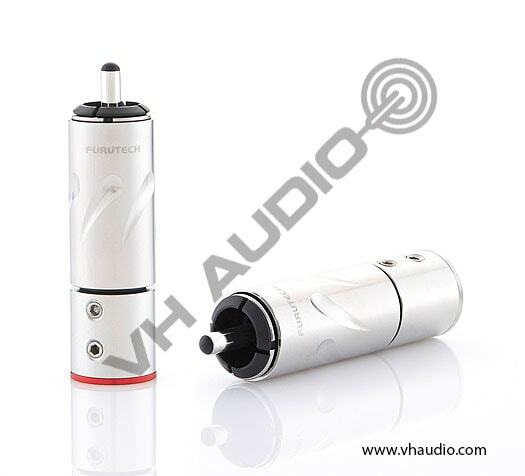 The Furutech FT-610mF mini female XLR is similar to the FT-608mF above but is the 4 pin version. It also uses Furutech's (Alpha) Phosphor bronze, as well as polyphenylene sulfide insulation for better solderability. Specified for core cable diamaters up to 5.0 mm. Must be soldered. The FT-2PS headphone connectors now allow you to upgrade your connectors or DIY some cbales for Sennheiser HD-545, HD-565, HD-580, HD-600, HD-650, and HD-25SP headphones! 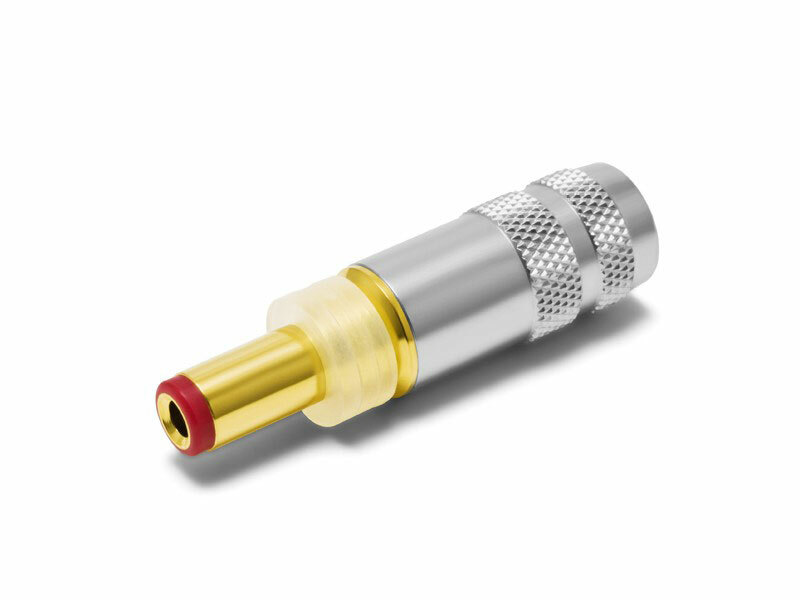 As with Furutech's other headphone connectors, the FT-2PS have (Alpha) phosphor bronze conductors. The insualtion body is also injected with a liquid crystal polymer resin, and the housing is a matte black finished nylon/fiberglass with piezo ceramic resin. Specified for cable core diameters ut to 3.5 mm. 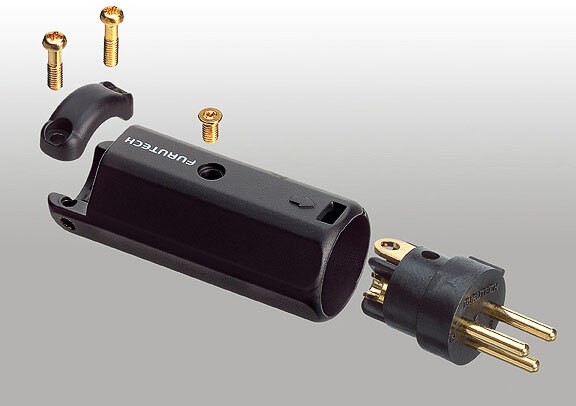 Lastly, Furutech has made some terrific connectors that fit the Sennheiser HD-800 headphones. 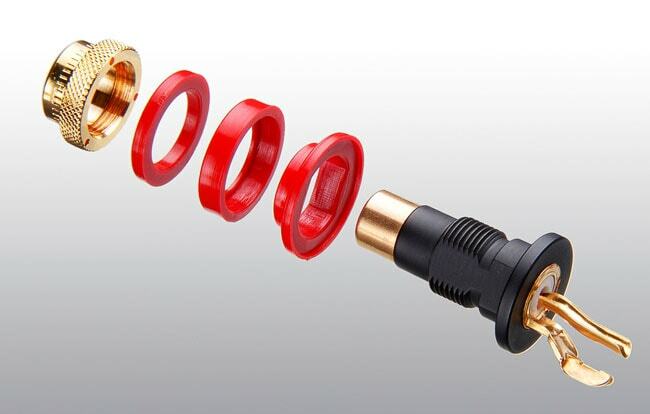 First, the FT-H800 again uses the (Alpha) phosphor bronze conductors, but also insulates these connectors with a nylon/fiberglass resin. The main body and end ring is non-magnetic stainless. The CF-H800 model is identical construction, with a carbon fiber layer on the body. Both of these H800 connectors will accomodate cable core diameters up to 3.8 mm. 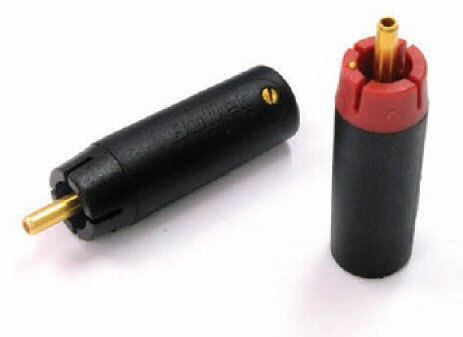 Furutech's FP-3-117 BNC plug uses a Flouropolymer dielectric, non-magnetic materials, and employs a high conductivity, Rhodium plated bronze central pin. The body is also Rhodium plated non-magnetic bronze. Maximum cable diameter/8.0mm and characteristic impedence is 75 Ohms +/- 5%.